From my perspective as Commissioner of Police in Western Australia, the difference that working together on matters of public health can make is phenomenal. In Fitzroy Crossing where influential women in the community, the police and the Government have partnered together we have seen around a 50 per cent reduction in the crime rate and a 30 per cent reduction in admissions to the emergency departments of hospitals. These are just a few of the things that happen when you take a very sensible approach to problems. It probably comes as no surprise to those who have followed my public utterances that I prefer prevention over prosecution. I’ve often criticised the community for their tendency to aggregate responsibility for alcohol harms to the centre. The idea that we want the police or the Government to fix it, when in fact the people who really need to be more involved are the community. By working together, with majority agreement, we can solve a whole range of things. One of the eternal problems of being a Commissioner of Police who speaks out loudly against issues like alcohol, is attacks by the pro-alcohol lobby. I’ve been subject to quite a few of them. You might remember last year’s footy grand final in which Fremantle were one of the protagonists. On that day the hotels in Fremantle were allowed to open at 6.30am in the morning, so I jumped up and down about how ridiculous that was. As a result, the President of the Australian Hotels Association came out and called me a ‘fusspot’ a ‘wowser’ and a ‘wet blanket’. These are the sorts of things you have to put up with. But to be honest, I’ve had a gutsful. I’ve had a gutsful of assigning scarcer and scarcer police resources to alcohol issues and alcohol-fuelled issues and being the only responders after 5pm to those sorts of things. Without cross-sector partnerships – like that seen in Fitzroy Crossing – we can’t hope to make a difference to some of the public health problems we’re talking about. The solution is not always tougher legislation and increased police powers. Few would argue that Australia does not have a problem with alcohol. I’ve been quite interested in the work of the Foundation for Alcohol Research and Education (FARE) which showed that 60 per cent of all people in Australia believe that we are not doing enough as a community to address problems caused by alcohol. About 75 per cent of respondents surveyed said we have a problem with alcohol, and 80 per cent think it’s going to get worse. We also don’t believe governments are doing enough. Now that’s an indictment on the community of Australia when 80 per cent of us say that it’s all going to get worse but we don’t have any strategies to deal with that. The other thing which came out of this FARE research is that we have a specific alcohol culture in Australia. Many call it binge drinking. I like to call it determined drunkenness – that is, a determination to go out and consume alcohol specifically to get drunk rather than for other more social reasons like to enjoy the experience. I think every generation of kids has gone out and experimented with alcohol. But the difference between what we may have seen decades ago and what we’re experiencing today is the level of determination. We know that about 80 per cent of all 14-24 year olds drink at risky levels and that 60 per cent of teenagers these days say that they drink to get drunk. That then becomes a problem for me as Commissioner of Police. These issues flow on to the work that we do on the streets. Whether that’s patrolling the streets or working in the night time economies, we are impacted by young people who are going out with a determination to get drunk. I’m surprised that so many people raise concerns about alcohol and look to the downstream end of the spectrum to fix it – police, courts, justice system. When in fact the problem ought to be resolved at the other end. For instance if you look at where kids get their alcohol from, we know that the majority get it from their parents. We have a whole generation of parents that can’t say no, who bow to peer pressure, who don’t want to disappoint their kids. And this is a real difficulty. If alcohol is a drug, then parents are the primary drug dealers. There’s no doubt about that. Next down the list of dealers is the alcohol industry itself. 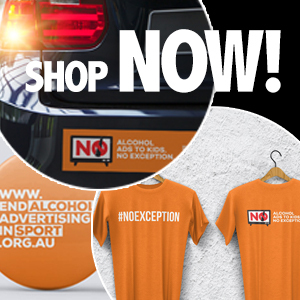 It develops and promotes advertising images that are attractive to our kids, gets messages out through social media, and promotes alcohol through live sport which young kids watch. Our children are exposed to sustained alcohol advertising all year round despite us being well aware of the problems it causes. FARE found that 64 per cent of Australian adults actually support a ban on alcohol advertising on TV before 8:30pm at night. But there’s been no real change. It’s no secret that I don’t like messages that link alcohol and sport. I’ve been criticising industry for years for doing that. Sports imagery and alcohol is a good example of how we as a community tend to promulgate the drinking and celebration cultures and meld the two together. From my perspective one of the strongest alliances we can create is to work together to deal with some of the myths which are perpetrated by the alcohol industry itself. We encounter a lot of resistance from the industry about imposing restrictions to protect the community. As police we work cooperatively to lodge interventions to applications for new liquor licenses, new liquor barns, and new hotels. Not necessarily to stop them from opening, but to make sure that sufficient consideration is given to the social impact, the health impact, the crime impact, what’s going on in those suburbs, what’s there now, and what is being applied for before any new development goes ahead. I think one of the things that’s missing in this picture is that the community itself does not have the right to lodge these legal interventions. And they ought to be able to have a voice, because communities are saying they’ve had enough of this. The communities don’t want to be pushed around by the multinationals any more. The way things are going in this State, and around Australia and the western world, we’re seeing greater social impacts on policing with a whole range of issues now affecting our business. We’ve just started to think about policing in a different way in Western Australia, as some have done in other parts of the world. Up until now policing has been an all-in model where officers can be called on for any number of tasks. And more and more, they were being tasked to deal with one problem and then quickly move onto the next, and the next. But in this model nothing qualitative is being added to the mix. The police might call in an extra service but unless there’s a coordinated and intelligent approach to follow up, then the problem is unlikely to be solved. We’re now separating tasks into two types of work. One is the crisis response work, where people call for assistance and police need to go immediately to the problem and resolve it. That’s always going to happen, it’s what police do. But the other type of police work is the ongoing assignments. If police are called out at night to an incident, who is going to get involved in the ongoing work and follow up with that family? What role do police have to play in that task? In WA we are now adding more police to the mix to fulfil this need. Their role would be to identify what are the health and social issues that are driving this demand for policing and look at how we can work together to knock it on the head. My reason for doing that is both practical and selfish: I want to do less unnecessary work. When we ran some metrics we found that the police in WA were attending some households up to 300 times in one year. 300 times a year my police are visiting them. So the question you have to ask yourself is: isn’t there a better way of doing things? If there are health issues or other underlying issues driving it, then we need to deal with those first. If we want to make changes to alcohol culture then we have a very big task ahead of us. We know the problems, we know the costs and we collectively know what some of the solutions are. But they’re not all going to be popular solutions. 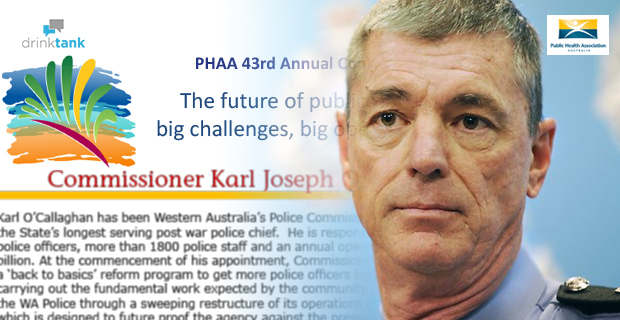 This is an edited extract of a presentation delivered at the Public Health Association of Australia (PHAA) 43rd Annual Conference held on Perth on 16 September 2014. You can see watch the video in full through the conference’s webcast portal or listen to the audio below. Don’t be too quick to start slapping your own backs yet Freo. Only a short time ago you were happy to flick a major percentage of the tiny dock to put in another boring supa Bunyip supermarket making the Port look like Ellie McPherson with a tinselled bolt in her neck.